My summer inspired 12" mini quilt arrived this morning and it's just gorgeous! Thank you Simone. I love love love it! And the choccie will remain hidden away in my sewing studio, away from children. Thank you Cheryll for organising another fun swap. Today, I will finish binding this pretty quilt. I've been happily binding it in the evenings, but now that I only have a little way to go, it's time to finish it and write up the pattern. Binding makes me happy and it's always a little sad when it comes to an end, don't you think? 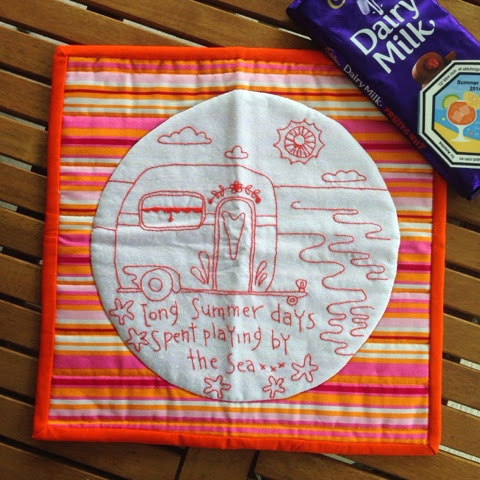 Oh I do love the gorgeous Mini Simone stitched for you. 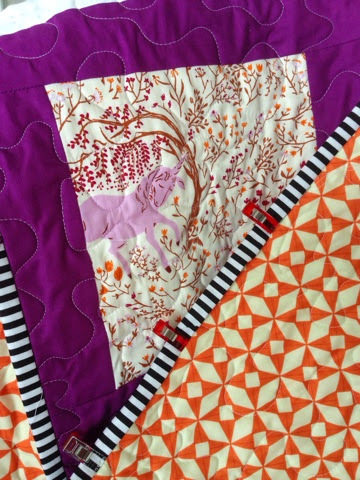 Lovely quilt you are working on. Your mini from Simone is gorgeous, Anorina. How cute is that caravan! I am so pleased you love the mini. I loved making it for you. The fabrics just reminded me so much of hot summer days. Enjoy your binding. I also love it when I get to that stage.